The Wizard makes the complicated simple. A proprietary algorithm produces our trade signals. But what you see is an intuitive, easy-to-use interface that delivers trade signals as powerful as you’d find on any professional trading desk. Scan any market in seconds. Your trades begin with The Wizard’s scanning tool. Simply select from a few options – timeframe, profit-taking method, index or category, trend strength and buy or sell signals – and the Wizard will return all results that match your criteria. Additional options include filtering for price and volume range. 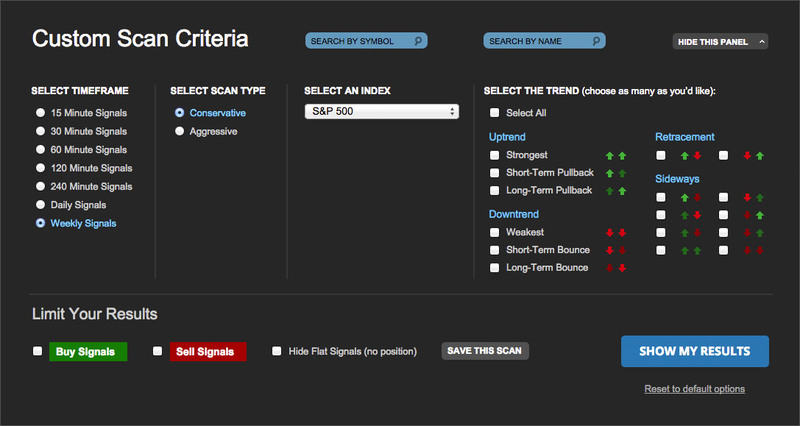 Once you’ve run your scan, we give you everything you need to place a trade. 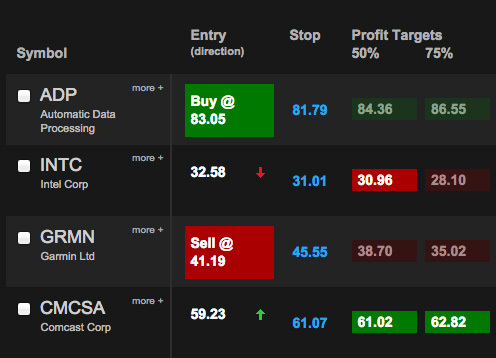 For each symbol, you get an exact entry price, exact profit targets, and a trailing stop. We also include a trend ranking for every symbol, last price, days held and current profit/loss for every single. Precise buy, sell and stop signals. Down to the penny. What separates The Wizard from other trading systems is our absolute precision. For each one of the over 10,000 stocks, ETF’s, futures and forex signals we offer, we provide exact buy and sell prices, profit targets and trailing stops. Right down to the penny. Quite simply, there is nothing else in the world that offers such precision for so many markets. Full transparency. We show profits and losses. Other systems claim great performance. But we show you. For every trade signal, we give you an up-to-date profit/loss, in both percentage and dollar terms. We also provide a composite performance. For every scan you may run, we display the overall winning percentage, breakdown of winners/losers and long/short, and total profit/loss. Always be on the right side of the market. The Wizard solves one of the greatest problems in trading: when to be in the market and when to be out. 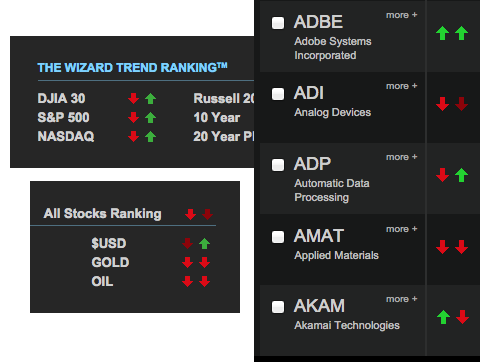 With our proprietary MarketTrends™ indicator, you’ll never have to guess. For every market, index and individual signal, we give you the trend, so you know whether to be long, short or out – before you ever take a trade. Get peace of mind – see 20 years of trend histories. In trading, trust is paramount. And it’s important to us that you trust our signals. So for every index, stock, ETF, futures contract, forex pair, sector and industry, we provide up to 20 years of our trend signals. Compare them to any price chart and you’ll see that if there was a major move in either direction, The Wizard caught it. We’re very confident our system. Compare it to any other system out there, and you’ll see what traders from all around the world already know: that there is nothing as simple, as powerful, as comprehensive and as precise as The Wizard.